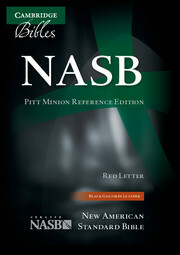 Pitt Minion Bibles are notable for their synthesis of function and style and have been a feature of the Cambridge list for many decades. In the current generation the text is presented in paragraph style, using a modern font that has many qualities in common with the traditional Bible typefaces. In the Pitt Minion design it delivers the characteristic combination of clarity with economy of form - producing a compact, slimline Bible that is exceptionally clear and easy to read. The NIV Pitt Minion Reference Edition now includes the New International Version text as updated in 2011, supported by cross-references, a concordance and maps. The words of Christ are printed in red and the Bible is printed on India paper with gilt edges and bound with a ribbon marker and presentation page in black calfsplit leather. 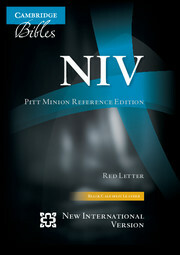 The Cambridge Pitt Minion is a deceptive little Bible. When closed, it feels like a small, compact Bible, but when open, it is surprisingly readable -- rivaling Bibles that are much larger. The font is small there is no doubt about that, but it is a very readable 6 ¾ /7 point Lexicon No. 1 which is sharp and clear. 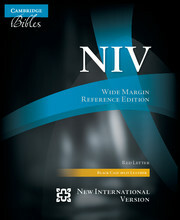 It is small enough to qualify as a compact Bible, however it is full-featured enough to be your main carry Bible if you like. The Bible is nearly the same size as the Clarion, but thinner. The text is laid out in a traditional double-column, center-column reference layout with the verses arranged by paragraph, except in the poetry sections. 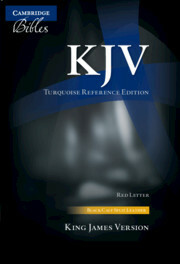 This is also a red-letter edition. I am personally not a fan of red-letter editions, mainly because the red ink is usually not very readable, often coming across as a horrid orange or pale pink. The red ink used in this edition seems to be a true red, and is quite readable. Usually, one of the biggest problems with a small, compact Bible is that they usually refuse to lay flat, especially at either end of the Bible. The Pitt Minion, however with its Smyth Sewn Binding springs open nearly anywhere. Although the front cover doesnt touch the table when opened to Genesis 1, it stays open. Also, this may well improve even more with some use. 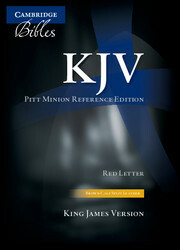 The Pitt Minion is bound and printed by Jongbloed in the Netherlands. The cover of my review copy is called Calf Split Leather. In Cambridges hierarchy of binding materials, the Calf Split falls below the full-grained Calfskin which is not offered on any of the Pitt Minion editions and above the French Morocco which I believe is being phased out. It is made when the hide is split, and then tanned to approach the quality and feel of full-grain calfskin leather. The grain you see is stamped on. There is a certain beauty in this pronounced grain. Its very elegant and understated. Although it is one of Cambridges lesser expensive options, it is still far superior to what most other Bible manufacturers call Genuine Leather which is usually pigskin. Although this cover is not as soft and flexible as Goatskin, it is still soft, and provides a certain amount of stiffness that is nice for handling a Bible with one hand. Many prefer this feel to the limp noodle feeling of some Goatskin bindings. The Pitt Minion is an outstanding format, and the Calf Split binding is very nice. I like it a lot. If this copy were in the ESV rather than the NIV, it would probably become my primary carry Bible. 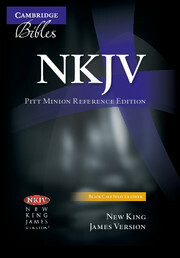 The review copy I was sent happened to be the NIV but the Pitt Minion is available in KJV, NKJV, NIV, ESV, NASB and NLT. There are several bindings available to suit your taste: Goatskin, Calf Split, French Morocco which may be being phased out and an Imitation Leather. 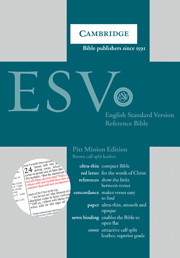 Regarding the imitation, I have a Cambridge Revised English Bible that is imitation leather, and if it is the same as what is used on the Pitt Minion, it could be an excellent, economical option. Although I really like this Calf Split leather, no matter which binding you select, you will be treated with a compact Bible that still has excellent readability that has a durable sewn binding that will last you for many years. All in all, this is an outstanding little Bible that can serve as either a small compact Bible for times when size particularly matters, or could even serve as your main or only carry Bible.